As a married woman, I work hard to support my family through the food selling business I have been involved in for 15 year, my husband being a farmer helps me a lot in providing some of the fruits and vegetables I need. I have been sustaining my business activities through my past 5 loans, I am here borrowing to buy food jars and additional raw material for my food production business, and I hope that my hard work will help me to attain my dream of saving money to expand my business and to renovate my house. 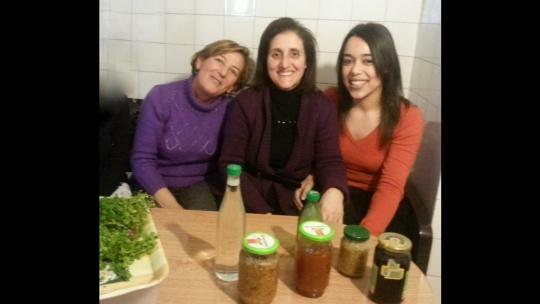 Noha is a member of ‘Fofa' group of 3 women entrepreneurs joined together to apply for a loan. Each group member receives a part of the loan for her business and all are interdependent and responsible for the repayment of the loan in its entirety. Noha is in the middle on the photo; she is accompanied by Hind and Latifa. The amount financed on MicroWorld corresponds to the total loan requested by the group. This loan is managed locally by our field partner Al Majmoua which is in charge of administrating the loan and repaying ENGIE by MicroWorld lenders.